World 4-4 is the fifth course of World 4 in Puzzle & Dragons: Super Mario Bros. Edition. It is a basic, underwater level with enemies consisting of Bloopers, Cheep Cheeps, Blooper Nannies & Babies, and a Coin Coffer. This course is unlocked by taking the secret exit in World 4- . This level is straightforward, consisting of a single battle, a ? Block, a battle with a Coin Coffer of any color, another ? Block, then a boss fight at the end with two Big Cheep Cheeps. 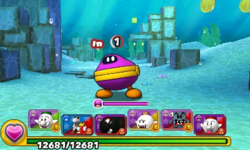 The player has all Orb types on the Orb field. ★World 4-4 is a difficult version of World 4-4 from ★World 4, with Fire and Dark Orbs disabled from the Orb field. The third battle now contains three Coin Coffers instead of one.